Everything begins with an E.
The Badseeds, Brooke and Dan, have been growing some winter squash like you wouldn't believe. Some are funky, some are gnarly, some are mammoth - they are all at once formidable and enticing. These squashes called to me for a few weeks, but I resisted, thinking that a two-person household with a maxed-out freezer couldn't possible address the entirety of a squash of that size. Until two weeks ago when just one taste of a Pink Banana squash finally caused me to cave. 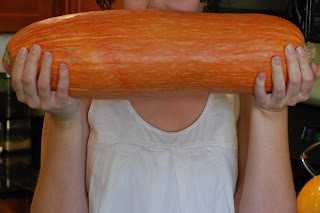 So I picked the smallest Pink Banana squash there was (huge though it may be) and came home to hunt for recipes. Several recipes. Brooke and Dan suggested treating this squash like a pumpkin so I headed straight for the "squashes, winter" section of Chez Panisse Vegetables. I found an ultra simple Pumpkin Soup recipe that welcomed the Pink Banana substitution perfectly. The Pink Banana is sweet, like pumpkin, and so a plain old pumpkin pie seemed like a natural fit. 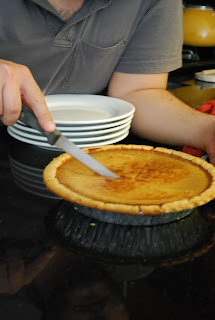 Using this Pumpkin Pie recipe from the Rolling Prairie Cookbook, Sergio made a lovely pie - it was a low fat version that was pretty good as is. But we also slathered it with whipped Shatto cream (not low fat). So we're thinking, next time we make it we might try making the pie full fat. It is a pie after all - in for a penny, in for a pound. Days later I still had what seemed like two pumpkins' worth of squash. I was home alone that week, while Sergio was out of town and so it was up to me to finish the remainder of this squash alone. I was pretty sure I was up to the task. I had kept the remaining squash in the refrigerator, the open end covered in plastic wrap for preservation. I pulled it out and started chopping, intending to make another a soup. Or a stew, rather, this one hardier than the pure pumpkin soup. While my stew was stewing I realized I still had a significant portion of Pink Banana squash left and I decided to tackle it in another dessert form, an ultra simple treatment this time. I just chopped what was left and roasted it for a short eternity in a hot oven with honey, brown sugar, and cinnamon. It occurs to me now that I never should have been so intimidated by the enormity of the pink banana squash given that it's such a versatile and flexible food. Savory or sweet, it lends itself to so many possibilities. Split the pumpkin and scrape out the seeds and pith, oil the cut surfaces with olive oil, and season generously with salt and pepper. Place the halves cut side down on a baking sheet, with a sprig of thyme and 2 unpeeled cloves of garlic tucked underneath each seed cavity. Roast in the oven for 45 minutes, or until completely tender. 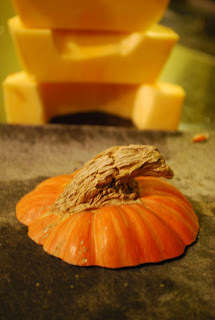 When the pumpkin is cool enough to handle, scoop out the flesh (or peel off the skins) and add the pulp to a soup pot along with the roasted garlic, squeezed out of its skin. Mash them together with a heavy wire whisk or a wooden spoon, add the stock, and heat to a simmer. Taste and correct the seasoning. For a richer soup, add a little butter at this point. While the pumpkin is baking, make black pepper croutons: cut the slices of bread into 1/2 inch cubes and toss them in the melted butter; salt, spread on a baking sheet, and roast in a medium oven until brown and crisp; generously grind black pepper over them as soon as you take them out of the oven. In this particular recipe, the pumpkin pie filling is completely fat free; all of the fat is found in the crust. There are those times when you really want to splurge with a crust, but consider baking this pumpkin pie filling directly in a baking dish. You'll have a really nutritious dessert that you can serve up as a pudding ... and you may not even miss the crust. 1 9-inch unbaked whole wheat pie crust. Preheat oven to 425 F. Place all filling ingredients in blender and blend until smooth. Pour into 9-inch unbaked pie crust and bake for 15 minutes at 425 F. Reduce temperature to 350 F and bake another 45 minutes or until set. Makes one 9-inch pie. Nutrition Information per serving, 8 servings per pie, baked in a crust: Calories - 232; Protein - 7g; Total Fat - 6.2g; Carbohydrates - 36g; Cholesterol - 1.5mg; Sodium - 410 mg; Vitamin A - 12% DV; Vitamin C - 5% DV. Heat 1 Tablespoon of the olive oil in a large heavy skillet over medium heat. Add the pumpkin and sauté until beginning to brown, approximately 10 minutes. Set aside. In a large soup pot, heat remaining oil over medium heat. Add garlic, onion, and hot pepper. Sauté until just beginning to get tender. Add cumin, cinnamon, cloves, chili powder, and salt. Stir to combine. Add tomatoes and their juice, along with the wine and/or broth, and the sautéed pumpkin. Bring to a boil, reduce heat and allow to simmer 20 minutes. Add beans and corn. Simmer for another 20 minutes, adding more broth if necessary to thin the stew. Serve hot, with a spoonful of sour cream and chopped fresh cilantro for garnish. Serves 6 to 8. Nutritional information per serving, 6 servings per recipe: Calories - 362; Protein - 15g; Total fat - 5.7g (sat. fat - 1.1g); Carbohydrates - 62 g; Cholesterol - <1mg; Sodium - 605mg; Vitamin A - 52% DV; Vitamin C - 84% DV. Preheat oven to 350. Or 400. Ish. I don't know - try 375 for good measure. Drizzle chopped squash with whatever amount of honey you deem appropriate. That should be enough - maybe add just a little bit more. Sprinkle cinnamon generously and brown sugar sparingly. Roast in the oven for what seems like forever but is actually like an hour. Or until squash is tender. Obviously. Enjoyed this post to the ultimate. "Good is not good because better is better."